This op-ed by Enough Project Sudan and South Sudan Policy Analyst Akshaya Kumar originally appeared on Al Jazeera America. Just two and a half years old, independent South Sudan is facing its first major crisis. In a country that remains heavily militarized, President Salva Kiir’s accusation that his former vice president had orchestrated a coup was explosive. Armed clashes broke out on the streets this week, and mortar shells have been rocking the normally peaceful capital. On Wednesday the U.S. Embassy evacuated all nonessential staff. A day later, after two U.N. bases were attacked in Jonglei state, U.S. President Barack Obama dispatched 45 troops to the young nation to protect the U.S. Embassy and personnel. Earlier this week, Kiir donned military garb to address the nation, dispensing with his trademark black hat, a gift from former U.S. President George W. Bush. This shift from civilian leader to military commander is ominous. South Sudan needs a political solution, not another civil war. The Sudan People’s Liberation Movement (SPLM), a coalition of former rebels who fought together — and at times against one another — during almost a quarter-century of civil war, is synonymous with governance and power in South Sudan. Since the party holds such power, devising a credible and transparent system to transfer authority within it is critical. Three of South Sudan’s most powerful men, each from a different ethnic group, have spent the past few months vying for a place at the head of the party. Each of them has seen it as his ticket to the presidency. In a country emerging from decades of war and the authoritarian rule of Sudanese President Omar al Bashir, any public campaign over executive power is unprecedented. The South Sudanese have never experienced the promise and pain of a winner-takes-all democratic process. In Sudan power has for decades switched hands only via coups. South Sudan must forge a new way forward, avoiding the pitfalls of its northern neighbor. Reconciliation and dialogue must trump a desire for vengeance. Many longtime observers worry that the country is on the brink of descending into another sectarian civil war. Of the three who were vying for party leadership at the beginning of 2013, Pagam Amum, the SPLM’s secretary-general, is being held by state security forces, former Vice President Riek Machar is in hiding and denouncing the current government’s legitimacy, and Kiir has adopted military dress. The potential for dictatorship and mass violence is growing. Still, there are glimmers of hope. Kiir has promised that he will “sit down with him — Riek — and talk … but I don’t know what the results of the talks will be.” Leveraging this commitment must be the centerpiece of any further engagement. The United States should commit itself to a sustained and multilateral campaign of diplomacy to ensure that South Sudan makes its way through this crisis. As a major contributor to the process that led to South Sudan’s independence and a guarantor of the Comprehensive Peace Agreement that ended Sudan’s second civil war, the U.S. should commit itself to a sustained and multilateral campaign of diplomacy to ensure that South Sudan makes its way through this crisis. The United States must engage actively with South Sudan’s key stakeholders to secure guarantees of due process for detainees and push for a political solution. The U.S. government’s Atrocity Prevention Board has a major role to play in coordinating a response across the government. The U.N. must take up a civilian-protection role by establishing patrols, blocking off corridors for humanitarian assistance and creating safe zones for those at risk. Obama’s decision to double down on diplomacy by committing his essential staff to staying on in Juba is laudable. However, much more needs to be done to protect civilians, especially since U.N. bases are now subject to attack and not being respected as sacrosanct. Former U.N. Secretary-General Kofi Annan argued that the international community’s “effective external response” to the 2007 post-election violence in Kenya proved that “the responsibility to protect can work.” South Sudan demands the same commitment from the entire international community. Read the full op-ed on Al Ajazeera America. 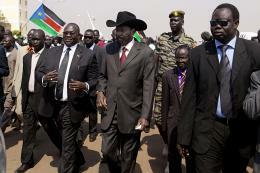 Photo: (L-R) Salva Kiir Mayardit (center), Dr. Riek Machar, and James Wani Igga (AP).